They are generally fuss-free or "fussy-less". The loaf shape makes it acceptable for me to eat them at breakfast, lunch, tea and post dinner. They are also acceptable at snack time. And above all, I love it's sheer elegance that comes from its simplicity of flavors. Just like my love for making my kitchen smell of cocoa and vanilla, I love, love the smell of fresh citrus fruits especially when I cut or squeeze them. 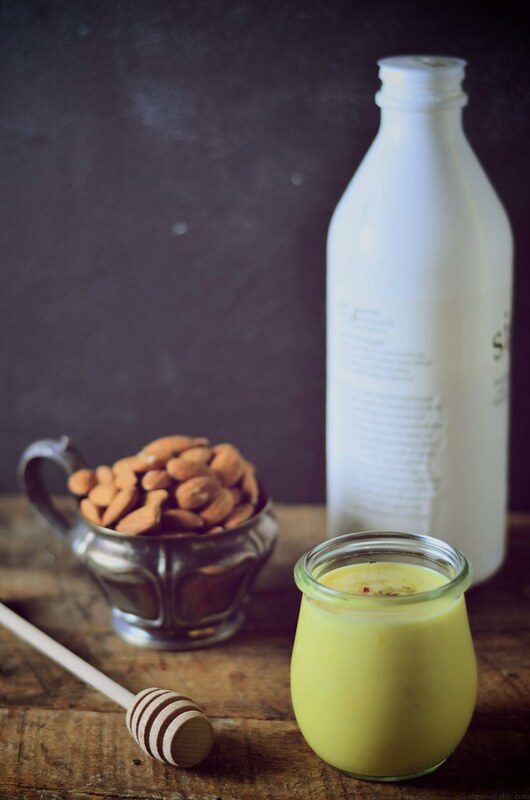 The aromatic oils from the skin and the fresh juices are energizing and refreshing and definitely lift up my moods. It's one of my most favorite moments in the kitchen and seriously, it can't get any better than the zest of six lemons. I stayed away from a traditional sweet lemon sugar glaze on the loaf because the honey gives the cake a delicious color and flavor as it caramelizes on the crust. I also added in some chia seeds to give the cake a texture and believe me, you won't be disappointed. 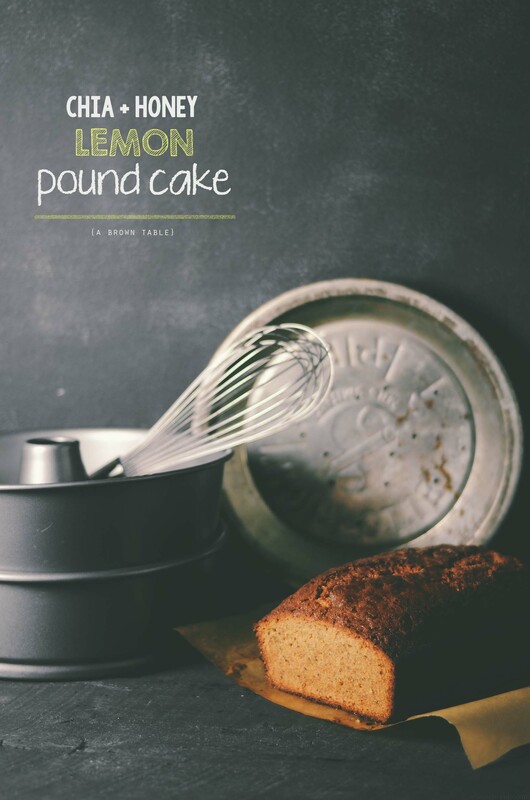 Plus, there's a hint of spices in this pound cake courtesy the magic Asian 5-spice mix that takes this lemon cake to a whole new level. I really wanted to call my cake, "5 Spice Chia Honey Lemon Pound Cake" but that just seemed too long, so I cut it short. If you can't find 5-spice, you can leave it out completely and the cake will still be delicious. This cake recipe went through a couple of trial and errors, till I had everything worked out. The first time I made this cake, I added way too much lemon juice and my cake didn't rise enough as the acid reacted with the baking powder and baking soda. I reduced the amount of lemon juice and increased the amount of lemon zest to keep the cake as lemony as possible. I would still recommend moving quickly as soon as you add the lemon juice to the batter as the chemical reaction between the acid and bicarbonate starts instantaneously. I adapted and modified the basic pound cake recipe from The Cook's Illustrated Baking Book. Note: You generally don't need to grease and line a baking pan, you can do one of the two, I prefer to do both as they aid in easy removal and transferring of the cake. 1. Preheat the oven to 325F. Lightly grease and flour an 8 1/2 X 4 1/2 inch loaf pan, line the pan with parchment paper and keep aside. Whisk the dry ingredients from the flour to the 5-spice powder mix. Sift the ingredients three times and keep aside. 2. Place the sugar and the lemon zest in the mixing bowl of a stand mixer. Toss the sugar and the zest to coat the zest completely. 3. Add the eggs to the mixing bowl. Using the paddle attachment whisk the eggs for 3 minutes on medium-high speed until completely blended. You might need to scrape the bowl down a few times with a silicone spatula to bring the ingredients together. Add the honey and mix on medium-high speed until completely blended for about 1 - 1 1/2 minute. 3. Stir the butter to mix up any solids that might have settled to the bottom. Pour the melted butter from the side of the bowl and continue to mix the ingredients on medium high speed. Add the lemon extract and vanilla. 4. Add half of the sifted dry ingredients from step 1 to the bowl and mix on medium-low speed until completely mixed. Add the chia seeds and the rest of the dry ingredients and mix till no specks of flour can be seen. Add the lemon juice and quickly mix the ingredients. Immediately pour the cake batter into the prepared loaf pan and bake in the preheated oven for about 40-45 minutes. Rotate the cake halfway through the baking process. The cake is baked when the center of the cake is firm to touch and a skewer/knife when inserted into the center of the cake comes out clean. Allow the cake to rest in the loaf pan for 5 minutes, then remove and transfer to a wire rack to cool completely before serving. In "Honey", "Lemon", "Pound Cake", "chia"
I stepped out of my shell this past week and did a lot of things, I would never have thought I would do. I wore shorts on a very chilly evening in winter (more on that later this week) and I tried my hand at making chicken wings. For someone that does not watch a lot of sports, it's a little ironic that I'm hosting people over for the game and making a game menu staple! The people in my life that love watching sports, love their wings a lot. So I was a little nervous when I decided to skip the traditional barbecue seasonings and do some flavor swapping and above everything else volunteer to make a batch for the upcoming viewing party. I had my reliable taste-tester taste (a reliable and known sports and wing aficionado) everything as soon as the first super hot batch popped out of the oven. I anxiously waited while the chicken was sampled and boy, was I thrilled as I heard "these are pretty darn delicious and there's a bite to it !". I felt like I had just won the Super Bowl of Wings. 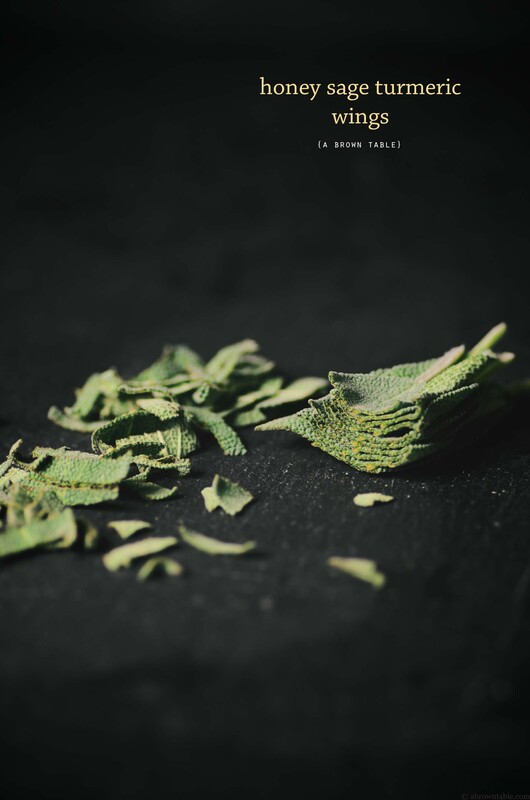 On a separate and unrelated note, chopping fresh sage is simply amazing, the fragrance is refreshing and comforting and adds the perfect aromatic touch to the kitchen in winter. A little cooking note here, tempura flour gives these guys a nice crispy texture but all-purpose flour will work well too. 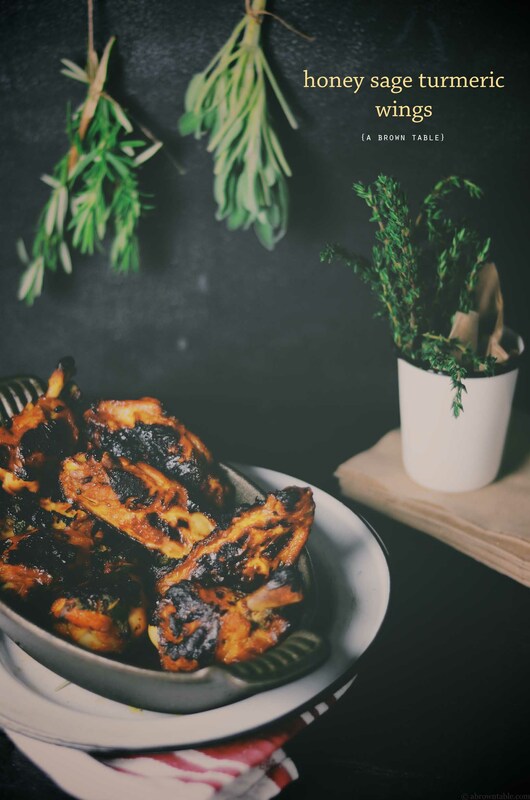 Let's just say these honey caramelized sage crusted crispy pieces of chicken are clearly going to be served at game and non-game related events at our home! 1. Pat the chicken pieces with a clean paper towel and place in a mixing bowl. 2. Add the rest of the ingredients to the chicken except the olive oil and tempura flour. Mix well and cover the bowl with cling film. Refrigerate for at least 3 hours before cooking. 3. Place a wire rack in the middle of the oven and preheat to 400F. Line two baking sheets with parchment paper. Brush the olive oil on the parchment paper. 4. Sprinkle the tempura flour over the marinated chicken and mix evenly. Evenly place the individual chicken pieces on each baking sheet, leaving about 3/4 of an inch space between each piece. Cook one baking sheet at a time. Bake for 35-40 minutes, halfway through flip each chicken piece with a pair of heat proof tongs. 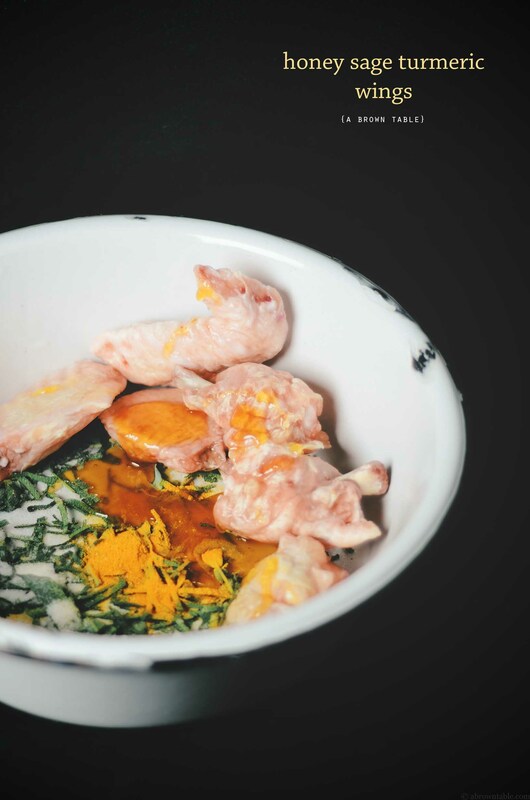 The wings are cooked when the chicken is cooked completely and the skin is blistered and crispy. Repeat with the second baking sheet. Serve hot immediately, garnished with a little extra sage and wedges of freshly cut limes and hot sauce of your choice. Note: You can make these hotter by adding more chili. In "Chicken", "Honey", "Sage", "turmeric", "wings"
I never grew up eating brussels sprouts, they didn't grow locally so we never ate them. However, by the time, I did get the chance to try them out, I had a lot of anxiety built up based on all the opinions I had heard over time, they were supposedly pretty nasty! 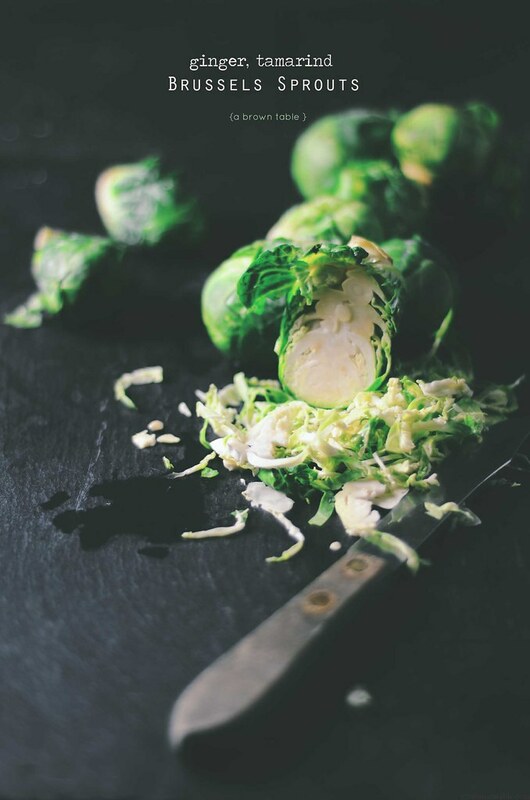 My first experience with the round cabbage-like doppelgängers was at a Thanksgiving dinner in Cincinnati, where the host had prepared a batch of seared brussels sprouts. You know that moment, when you are seated as a guest at someone's dinner table, and you feel obliged to try everything, yeah that was me sweating it out! With a lot of nervous apprehension, I stuck a fork into one of the four sprouts I picked off the serving dish and put one into my mouth. Lo and behold, they were actually good, actually better than good, they were delicious and I couldn't fathom what the fuss was all about. Fast forward to today, I'm in my kitchen cooking them every time these guys are fresh in season. The bitterness is what drives many people away from these little guys. What kills the bitterness? Shaving the sprouts super thin! The finer the shave the better. It also makes the entire dish feel lighter in taste and texture. Which is even better because this recipe is light and healthy and packed with a bunch of great zesty and sour flavors. Also, on a side note, I love this dish with wine, it goes really well with whites and reds. Let's talk a little bit more about the flavors, there's fresh ginger root, sour tamarind and fresh honey for the flavorings. I don't overcook the sprouts, just enough to get the shaving gently sautéed and to help bring out the ginger flavors. 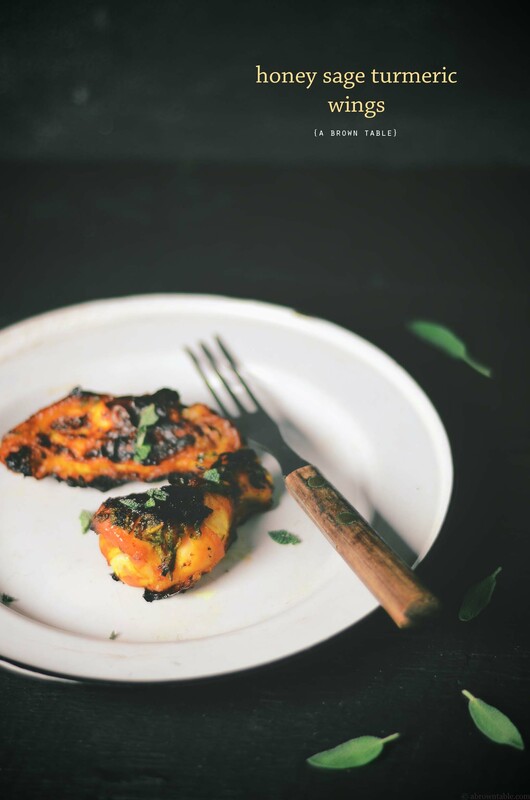 Both ginger and tamarind are really popular ingredients in Goan cooking and the combination here is perfect! 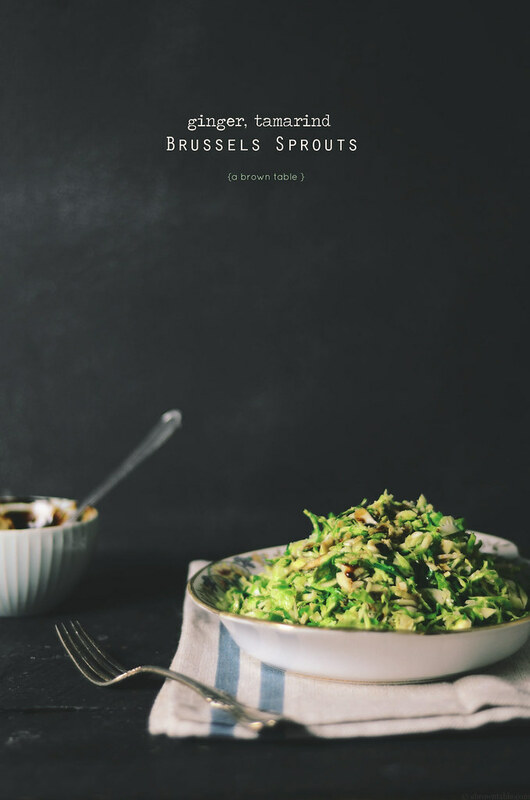 Most of the time, when I cook these brussels sprouts, I will eat it as an entire meal but you can also serve this as a side with meat, poultry or fish. 1. 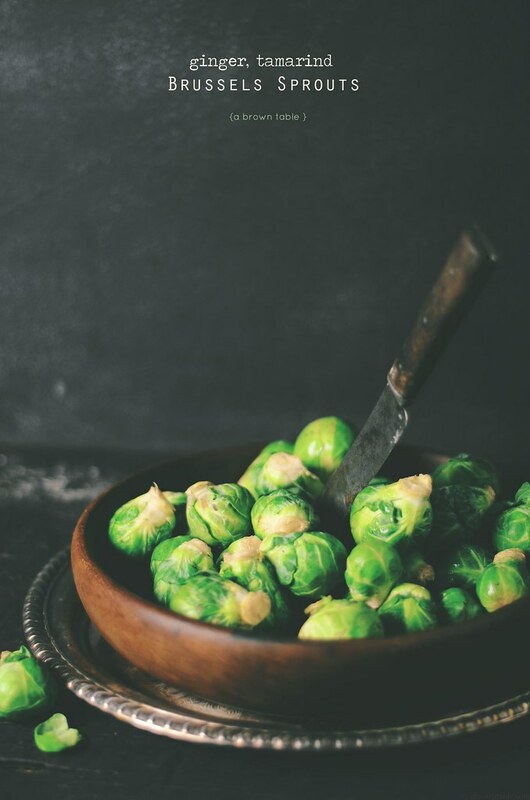 Rinse the brussels sprouts under running tap water, drain, and pat dry with a clean towel. Trim the ends of the sprouts and discard any damaged outer leaves. Cut each brussels sprouts in half and then slice them extremely thin to get fine thin shreds. Alternately, you can also shave them on a mandolin slicer using the thinnest setting. Keep aside. 2. Heat the olive oil on medium high in a thick bottomed pan or skillet. Once the oil begins to heat up after approximately 30-40 seconds, grate the ginger root directly onto the hot oil using a microplane zester (or the fine teeth of a grater). 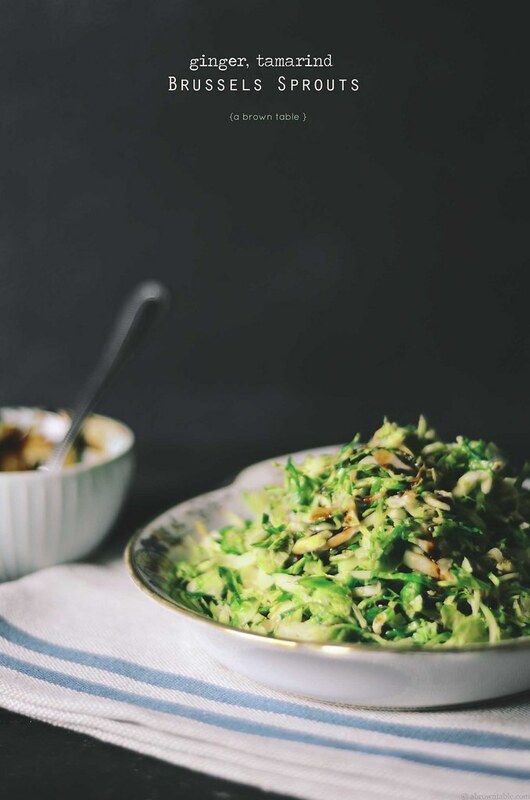 Quickly stir and cook the ginger for 30 seconds in the hot oil, add the brussels sprouts to the oil, mix well and cook with occasional stirring for 8-10 minutes. Season with the salt and pepper and adjust the amounts if needed. 3. In a separate bowl, mix the tamarind, hot water and honey to a thin paste. Taste and adjust the sweetness with more honey if desired. If it is too acidic then you can add a little more hot water. 4. Serve the warm brussels sprouts with the tamarind sauce on the side. You can also drizzle a little sauce over the brussels sprouts and then serve the rest of the sauce with it. In "Ginger", "Honey", "Tamarind", "Vegetarian", "brussels sprouts", "healthy", "light"
It's getting chillier by the day and something tells me this winter is going to be a little intense. Thankfully, I have some canning recipes in the works that are helping me stock the pantry up. Yes, I might be surviving on a whole lot of jams and pickles this cold season. I thought my previous post on the poached fig sauce would be the last, but I was so wrong! The last time I came back from my grocery store, a couple of figs magically popped up in my grocery bag. I could have just eaten the entire batch directly but then I knew I would miss them for the rest of the year. So what's one to do but stretch their presence out a little longer, perhaps till the next fig fruiting season? Since canning is my new culinary addiction, I turned to making a sticky and sweet fig preserve with bold flavors that would happily remind me of autumn. This preserve uses whole figs that have their stems removed but I keep their skins because I like them. If you are not a big fan of the fruit's skin, then by all means peel them off with a paring knife. 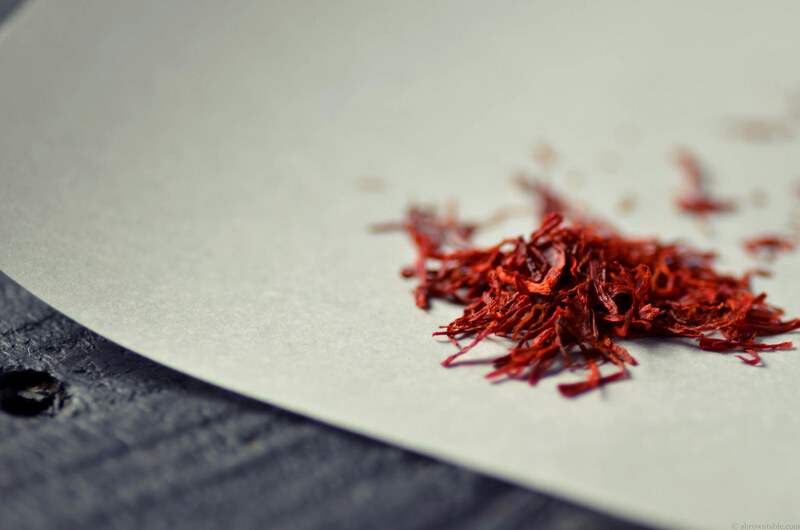 Use good quality dry spices for this recipe because they will make the preserve taste better. The cinnamon flavor is gentle yet warming but the dry ginger powder gives the figs a delicious and bold zing. 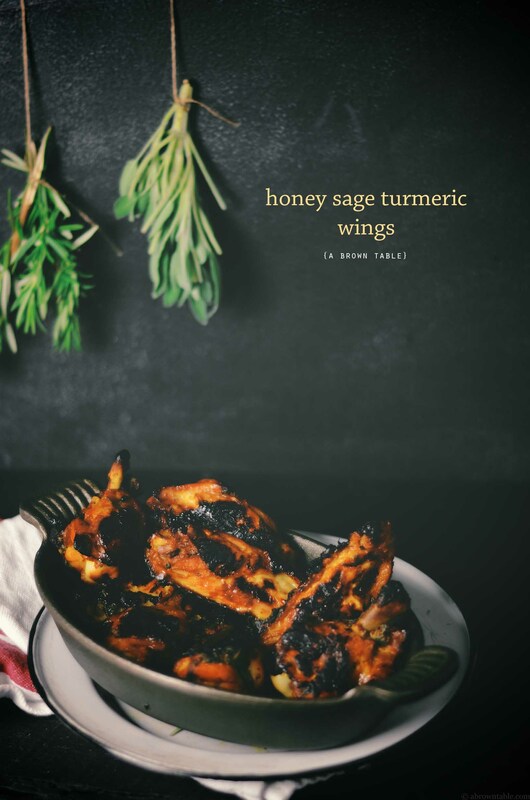 Instead of using brown sugar in this recipe (which you most certainly can try), I find honey to be my preferred choice of sweetener for the fig preserve, somehow that marriage between honey and figs is truly blessed. Yeah, I also like to add a bit of booze to everything I cook, so here it is a cup of Riesling. 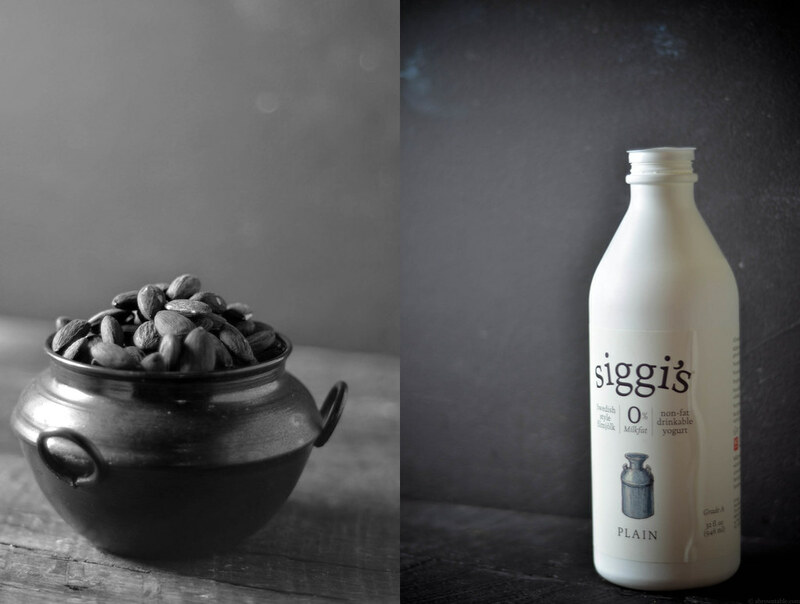 It brings everything together in my opinion without taking away from any of the flavors of the figs. 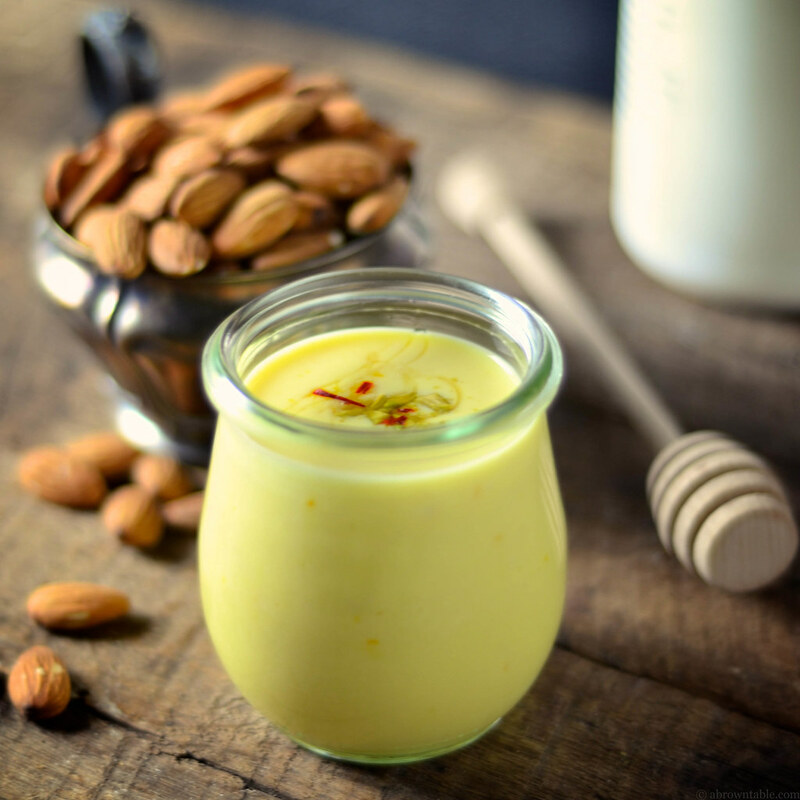 Serve this on top of some thick plain yogurt for breakfast or spread it over buttered bread. You can also serve this with some sharp cheeses at your parties for an appetizer. Remember with this preserve, a little of it goes a long way! 1. Put all the ingredients together in thick bottomed saucepan. 2. Heat on a medium to high flame and bring the contents of the saucepan to a boil. Stir constantly. This should take about 10 minutes. Don't be surprised if the viscosity of the honey decreases and the hot liquid begins to thin, this is absolutely normal. 3. Mash the figs with a potato masher to release the fruit's pulp. 4. Reduce the flame to the low setting on the stove's dial. Cook the figs for total time of 1 hour. Stir the mixture once or twice every 5 or 8 minutes. The volume will reduce during the process. 5. Transfer the hot preserves to sterile four, 4 pint jelly jars and seal. Process for 10 minutes in a boiling water bath. Cool for another 5 minutes in the water bath before removing to cool and store. Update: The recipe has been updated to reflect the addition of the lemon juice. In "Canning", "Cinnamon", "Figs", "Ginger", "Honey", "Preserves"